In 1839, England rented a factory building on a piece of land between Pomeroy Street and Kender Street, just off the Old Kent Road. The premises consisted of a cottage and manufactory and had been used by Henry Duxbury, who was involved in the leather trade. 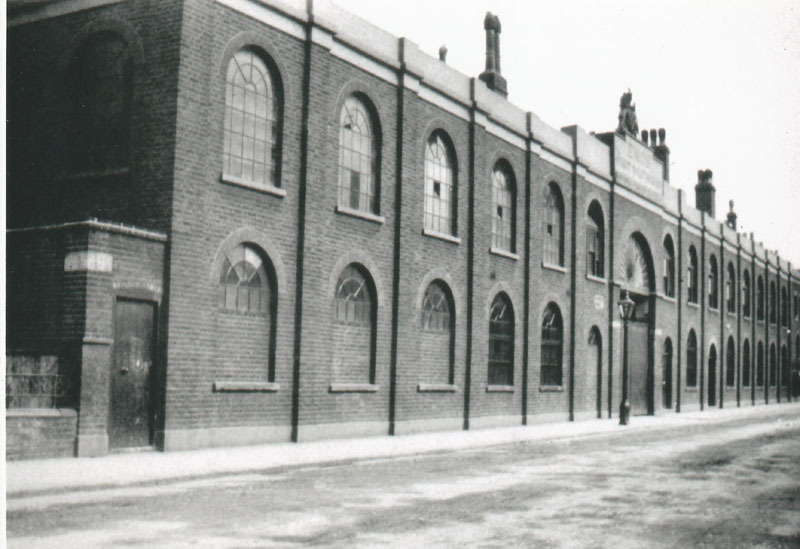 George eventually purchased the factory, which he named The Hatcham Iron Works. The 1846 edition of the Post Office Directories lists him as ‘England, George & Co. Engineers and patent screw jack manufacturers, Hatcham Iron Works, Old Kent Road’. One noteworthy aspect of the Hatcham site was that it had no direct access to the main railway system, which meant that finished engines had to be taken by road to the nearest railhead, usually at New Cross. In 1853 the factory was extended, being largely occupied in making castings for the Crystal Palace. In 1861/2 a further, larger, extension was added to the buildings in Pomeroy Street, this time on the north side of the original works. At the rear of the new works was a piece of land nicknamed ‘the cabbage patch’, on which was laid an oval of standard gauge track, like a large toy train set, There was a rail connection into the main building and the circle was used to test locomotives in steam. Following the effects of the 1865 strike, the works were taken over by ‘The Fairlie Engine and Steam Carriage Co.’ This did not thrive and the works were sold in 1872. The 1853 building was occupied by the General Engine & Boiler Company from 1873. In the mid-1930s they became Reliance Foundry, who remained until 1981, after which the building was demolished. The original part of the factory housed the Delta Metal Co. who were succeeded by the Pomeroy Paper Mills and then an automotive engineering shop. The 1862 portion was bought in 1877 by J.C. Eno, of Fruit Salts fame, though they left due to bombing in 1940. After the war the building was used by the pharmaceutical firm of Robert Blackie & Co until 1969, after which it was pulled down to make space for housing. For further detailed information on The Hatcham Iron Works, please click on the link below to visit the archive section of this website which is updated regulary with new information as it comes to light.